"Hey Xavier, would you be interested in a Colt?" We were getting ready for a case, and the x-ray technician's question was music to my ears. "I dunno. What kind is it?" I asked. "A M1991A1," replied Ralph, as he maneuvered the C-arm past my back table. "I took it to the gun store to trade in on a Smith & Wesson M&P, and they only offered me $300." "That's too bad. Is it in decent shape?" "Yeah. It's a bit beat up, but not bad," replied Ralph. "I have some custom grips on it." "Sounds good. Meet me after work?" "OK, but the deal is dependent on whether it shoots reliably." So it was that I met up with Ralph after work to take a look at another Colt. When he took the blue case out of his truck, my mouth began to water. The Hogue wrap around "Good Year" grip stopped my Pavlovian response though. I hate those things. 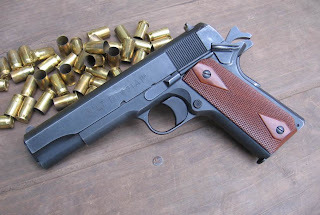 The Colt M1991A1 is actually a 1911 manufactured by Colt to meet a certain price point. It was first introduced in..... 1991, and the gimmicky new name was emblazoned across the slide like a big bumper sticker. The finish was parkerizing, and the pistol contained the Series 80 firing pin safety. It was a basic gun, not glamorous, but reliable and effective. The factory installed a plastic trigger and a plastic mainspring housing to meet the price point desired. The model designation is still used, but today's version of the 1991 pistol is brushed blue with sandblasted rounds, and the pistol comes with nice wooden grips. It also sells for seven hundred dollars or so. Ralph's pistol had some finish wear, and on field stripping it, it appeared as though he used 3 in 1 oil and WD-40 for lubricant. Other than the outer finish wear, it hardly looked to have been fired. "You shoot this much?" I asked. "Nah, I just had it to have it," he replied. I went through my process of checking a used 1911 prior to purchase. The thumb safety did not ping when the hammer was pulled back. The feed ramp had not been touched. The bore was like new. The barrel fit well, as did the slide. The magazine was a no name stainless steel mag, but it looked decent enough. The 1911 wheels in my head got a quick kick start. In my spares box at home, I had a solid black aluminum trigger. I also had a checkered aluminum mainspring housing. I had walnut double diamond grips. This pistol would take very little to turn into a very nice, serviceable 1911. In fact, I would have to put no further money into it. "I tell you what Ralph, I'll give you three hundred today, and the remaining one fifty after I shoot it," I offered. "Fair enough," said Ralph. I placed the Colt in its blue box, snapped it shut, and drew three Benjamins out of my wallet. 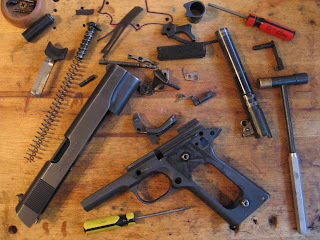 Once home, I took out a few tools and began to detail strip the Colt. Everything was dry and in good shape, except both bushings unscrewed with the grip on the left side of the pistol. I used a pair of vise grips and a screwdriver to free the trapped bushings from the fat rubber grip, and then I set them back into the receiver with red LocTite. I used brake cleaner to dissolve the gummed up oil inside the pistol. Digging through my spares box I found the trigger, mainspring housing and grips. It would take a lot to get me to change my mind now. I did a trigger job on the pistol and installed the parts. I removed a little metal from the tab of the grip safety to make it more responsive in my hands. I deepened the plunger recess in the thumb safety so it would engage and disengage with more authority. I dressed the extractor. Finally, I went to my range bag and retrieved a blue Shooting star magazine and stuffed it in the bottom. The pistol was starting to look like a clean, no nonsense pistol. I was sold. Over time, my tastes in handguns has meta morphed from a love for large capacity European 9mm blasters, to plastic fantastics, to 1911 trend setters. Back in 1991, when this Colt pistol first hit the market, I was wrapped up in the 9mm wonder gun scene. I had passed them by at $400. Now, it is a fortunate man who finds one for that price, in almost any condition. I stuffed the Colt M1991A1 and some ammo in my range bag for a trip to the range. I shot 230 hardball, 185 grain hollow points, and a couple magazines of reloads. I shot the pistol right side up, upside down, and on it's side. I let my thumb ride the slide and I limp wristed it. No matter how I tried to induce a failure, the Colt gobbled anything I had to stuff into it's magazine. It was accurate, more accurate than I was. It looks like I'll be taking $150 to work in the morning. I love my stainless 1991A1! it is a great shooter and it is my main carry gun. I have probably shot over 5000 rounds through it with nary a stoppage. The firing pin safety failed once early on, and I had it replaced right away with a higher quality part. no issues since. When I saw the "before" pictures, I was thinking how much I would love to have that gun for $450. When I saw the "after," I started drooling. You sure did a great job. 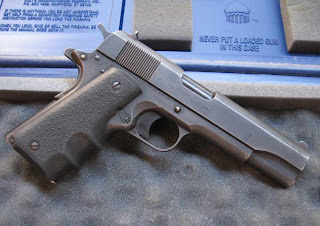 I'm in the market for an M1911 now, but where I live they're hard to find, unless you can afford to get a new one. If you ever think of selling it. . .
Man, I love what you did with that beauty. She's a real looker now. I don't know why you hate the rubber grips. I have medium size hands, and those Hogue jobs fit like a glove. I have one on both my carry 1911's. I used the hard wood grips that came on the Officer's, and they about ate my hide clean off with IWB carry. They didn't feel good in my hand either. These Hogues fill my hand well. It feels like an extension of my hand. I shoot well with them. Better than without. So why doncha like 'em?? Also, thanks for all the info you provide. I've learned a great deal from you and pass on your site as a reference whenever I get asked about mindset, or "should I get a CCW?" We get on the same page quickly, and can have an informative discussion. Kinda like having the same vocabulary, so we aren't using words, but meaning different things. It's fun when folks know your a shooter and offer you stuff at good prices. Makes up for the times when anti-gunners berate you for you hobby. I've had two compact and one commander 1991A1. Loved all three. Sadly all have been sold to feed my other obsessions. You have yourself a nice pick up. ENJOY! beeyootiful! that was one dumbass gun shop. how could they not know that yanking off that innertube, slapping on some wood, and a nice detail job would make that a $700 gun with ready takers in today's retail market? good job. their shortsightedness (or shortmoneyedness?) is your gain. you're lucky he didn't walk in my shop with it. good job. Nice catch! Color me jealous. I have a park'd '91A1 Commander that's carried on a regular basis and I love it. Oh, sure, the thing isn't perfect; for example, the slide cuts at the muzzle are radiused a bit differently from side to side. Of course, I don't look at it from that end too often! It's pretty accurate, feeds everything, and, above all, it's a Colt. I've enjoyed it so much I bought a second one; that one ended up going to a good friend of mine, where it protects his home and family. 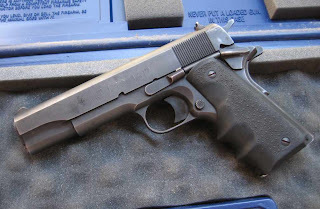 For folks who want a Colt but can't swing the change for an XSE or a Series 70, these '91s are the ticket. While I paid more for mine than you did for yours, it was in the same ballpark and worth every penny. StxRynn, the Hogue wrap arounds feel good at first and do a decent job of soaking up recoil, but finger groove grips usually are cut for hand sizes that really don't exist. I used them for a while, but eventually moved on to something else. They also just don't look all that great when compared to other traditional slab types. I prefer the Hogue rubber slabs over the finger groove type, but I more appreciate wood grips or Alumagrips. Xavier, I'm surprised you don't have a 1911 grip bushing tool; I've boogered up those bushings using just a screwdriver. Brownells sells one that fits into any generic exchangeable tip screwdriver- it fits around the bushing like a socket with a flat blade screwdriver tip on the inside to engage the bushing itself. No worries about it slipping off, dinging the bushing, or gouging the frame. I forget what they ask for them, but it's worth picking one up. Several years ago, I had a nice, blued 1991A1 Commander, and I traded it off. Stupid! Stupid! Stupid! You always get the best deals! Nice gun BTW, a simple, no-nonsense pistol. I have the Hogue grips on a mil-spec Springfield. They fit my hand like a glove. A friend of mine hates 'em. The nice walnut grips that came with the Springfield are sitting in a drawer. I carry the gun sometimes, and would hate to see the grips get the wear and dings that come with everyday handling. $450 for an ORM 1991 is a fair price these days, seems about the going rate these days. Amazig how much better it looks after ditching thse horrid finger grove grips. I came across a parkerized 1991 commander at the local gunshop. I really didn't need another 1911, but after reading your posting that night I went back and bought it the next day. Besides, it's my first 1991:) Thanks!